What if you want to switch to a different set of applications on Your MacBook? For example, suppose that you’re slaving away at your pixel-pushing job — say, designing a magazine cover with Pages. Your page design desktop also includes Adobe’s Photoshop and InDesign, which you switch between often. Suddenly, however, you realize you need to schedule a meeting with others in your office, using Calendar, and you want to check your email in Apple Mail. What to do? Well, you could certainly open Launchpad and launch those two applications on top of your graphics applications and then minimize or close them. But with Mission Control’s Spaces feature, you can press the Control+← or Control+→ sequences to switch to a different “communications” Desktop, with Calendar and Apple Mail windows already open and in your favorite positions! Here are multiple Spaces Desktops at the top of the Mission Control screen. 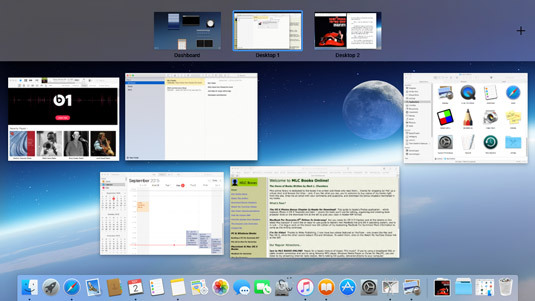 Mission Control is the desktop manager in El Capitan. To create a new Desktop for use in Spaces, click the Launchpad icon on the Dock and then click the Mission Control icon. Now you can set up new Spaces Desktops. Move your pointer to the top right of the Mission Control screen, and click the Add button (with the plus sign) that appears. (If you’ve relocated your Dock to the right side of the screen, the Add button shows up in the upper-left corner instead.) Spaces creates a new empty Desktop thumbnail. Switch to the new Desktop by clicking the label at the top of the Mission Control screen, and then open those applications you want to include. (Alternatively, you can drag the applications from Mission Control onto the desired Spaces label.) That’s all there is to it! To switch an application window between Spaces Desktops, drag the window to the edge of the Desktop and hold it there. Spaces automatically moves the window to the next Desktop. (Applications can also be dragged between Desktops within the Mission Control screen.) You can also delete a Desktop from the Mission Control screen. Just hover your pointer over the offending Spaces label to display the thumbnail, and click the Delete button (with the X) that appears. You can jump directly to a specific Spaces Desktop by clicking its thumbnail in your Mission Control screen or by holding down the Control key and pressing the number corresponding to that desktop. Finally, you can always use the Control+← or Control+→ shortcuts to move between Desktops and full-screen applications.